Forsinard and the Flow Country. The Flow Country of Caithness and Sutherland could be set to join the Taj Mahal in India, the Grand Canyon in the USA and the Great Barrier Reef in Australia as a World Heritage Site. 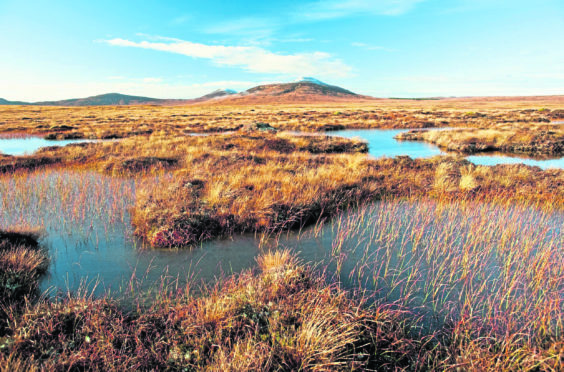 UNESCO World Heritage status is being sought for Europe’s biggest blanket bog. The 1500 square miles expanse of peatbog, lochs and bog pools is more than twice the size of Orkney. Now a working group has been set up with the aim of securing UK Government approval for an application to UNESCO for the designation and a public consultation on the bid is to be held early next year. Six of the UK’s 31 World Heritage sites are in Scotland. They are the Antonine Wall, Heart of Neolithic Orkney, New Lanark, the Old and New Towns of Edinburgh, St Kilda – the only double status site – and the Forth Bridge. A wide range of organisations are involved in the Flow Country Unesco bid and include Scottish Natural Heritage, University of Highlands and Islands (UHI), Highlands and Islands Enterprise, Highland Council, RSPB Scotland and Federation of Small Businesses (FSB). CVS North, Wildland, VisitScotland, Scottish Land and Estates, Confederation of Forest Industries, Forestry Commission Scotland and Rural Payment and Inspection Division are also involved. David Richardson, of the FSB, said: “The Flow Country is of international significance and yet it remains one of our best kept secrets. The bog provides the diversity of habitats necessary to support a wide range of wetland and moorland species. Of particular importance are the birds, many of which are typically northern species found here towards the southern limit of their range. These include red-throated diver, black-throated diver, golden plover, greenshank, golden eagle, merlin and short-eared owl. Joe Perry, the project co-ordinator for the Flow Country World Heritage Site Working Group, recently explained the thinking behind the initiative. “We believe that the Flow Country deserves to be inscribed as a World Heritage Site, joining the Great Barrier Reef and the Taj Mahal, in recognition of its outstanding universal value,” he said. “To this end, we are working hard to put together a technical evaluation for the Department for Culture Media and Sport, who will then decide whether or not to give us the go ahead for a full application to UNESCO. The working group will now need to carry out three main tasks which will take up to 18 months to complete which includes developing a boundary and carrying out extensive consultation.